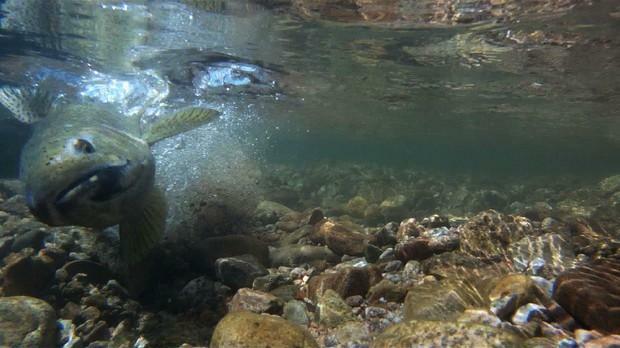 An adult steelhead digs a crevice into a streambed to deposit fish eggs into the gravel. Environmentalists worry dredging can upset the spawning cycle by disturbing these deposits. U.S. District Judge Marco A. Hernández rejected water quality standards that were submitted to the EPA by the Oregon Department of Environmental Quality. Hernández’s ruling Wednesday came in response to a lawsuit filed by Northwest Environmental Advocates. The group charged in its lawsuit that the EPA should not have accepted those plans. They were used to decide regulation for activities that affect water temperatures — like cutting trees along river banks and discharging treated wastewater. Northwest Environmental Environmental Advocates executive director Nina Bell said in a statement that the ruling was welcomed, considering how long her advocacy group has been pressing for rules that are strong enough to keep water cold enough for imperiled salmon, bull trout and steelhead. “After waiting decades for the agency to establish and then use temperature goals for Oregon waters that are safe for salmon, it is gratifying to see the end in sight,” she said. It's not the first time the EPA has been ordered to comply with legal requirements to protect fish from warm water temperatures in the Pacific Northwest. A federal judge in Seattle ruled in October that the EPA must protect fish from warming waters Oregon and Washington. Hernández ordered a new plan by March for fixing Oregon’s water quality standards. NWEA said it had obtained a court order in 2012 to establish more fish-friendly water temperature standards in Oregon rivers, the existing standards were kept in place by environmental regulators. River basins impacted by the rules include the Willamette, Rogue, Umpqua, Grande Ronde, John Day, Klamath, Umatilla, Middle Columbia-Hood, Malheur, Snake and Sandy.